The Davis County Music Boosters is currently holding their annual pizza fundraiser to raise money to help ensure that the school has everything they need to support a quality music education for our DC kids. You may purchase items from any 5-12 band student, or 7-12 choir student. Order forms are due Tuesday, March 26th. Thank you for your support! Tonight is the DCHS/DCMS 5th-12th grade Band Concert and Soup Supper. Please join us from 5:00-6:30 for our soup supper with the concert beginning at 7:00. Cost is $5.00 for all you can eat soup and desserts. Davis County Schools will run buses on Hard Surface Routes only for Thursday, February 14, 2019. Here is a link to our Hard Surface Routes map https://5il.co/6f6x. There will be a Baseball Parent/Player meeting on Wednesday, February 27th at 6:30 in the DCHS Commons. The meeting is to discuss going to St. Louis in June 2019. The meeting is for 8th-12th students who will be playing baseball this year. The bowling meet scheduled for tomorrow has been postponed one more day. It is now scheduled for Thursday, February 14th at 12:00 p.m. in Muscatine. Tonight's 1st Round of Boys Basketball scheduled to play in Albia at 6:30 is now rescheduled to Wednesday, February 13th. Other activities that we have going on for Wednesday, Feb. 13th are: 1A Bowling, Muscatine, IA-Bowlers leaving at 5:45 am. HS/MS SEIBA Honor Band, Iowa City, IA-Students leaving at 9:15 am. Costa Rica Trip Meeting-5:30 pm, HS Library. We have so many good things going on at Davis County Schools despite what mother nature throws at us!! The good news is that ALL of this winter weather will be out of here come May!!! Davis County Schools will run buses on Hard Surface Routes only for Wednesday, February 13, 2019. Here is a link to our Hard Surface Routes map https://5il.co/6f6x. Due to weather, Davis County Schools have cancelled classes for Tuesday, February 12, 2019. Well...Mother Nature is hitting us again!! The 1st Round of District Boys Basketball scheduled to play in Albia, has been postponed until Tuesday, February 12th at 7:00 pm. Davis County Schools will run buses on Hard Surface Routes only for Monday, February 11, 2019. Here is a link to our Hard Surface Routes map https://5il.co/6f6x. Tonight's Boys BB game is being played as scheduled. Action will start at 6:00 pm at New Sharon High School. Due to weather and poor road conditions, Davis County Schools have cancelled classes for Friday, February 8, 2019. A decision on activities will be made tomorrow (Friday). Due to weather, Davis County Elementary Math Nights for 1st Grade and 3rd Grade have been cancelled. Due to weather, Davis County Schools have cancelled classes for today, Thursday, February 7, 2019. Davis County Schools will have a two-hour delay and run buses on Hard Surface Routes only for Thursday, February 7, 2019. Here is a link to our Hard Surface Routes map https://5il.co/6f6x, please note it has been recently updated. Preschool Family Night for tonight, Wednesday, February 6, 2019 has been cancelled. Due to weather conditions, Davis County Schools have cancelled classes for Wednesday, February 6, 2019. Due to predicted weather, Davis County Schools will be dismissing classes at 1:00 today, Tuesday, February 5, 2019. Join us tonight for our last home Girls/Boys Basketball Game as we host Cardinal. It is sure to be a great time had by all!! Dear Parents and Guardians, Davis County High School would like to inform you that while we have sufficient heat in all second floor classrooms and in the cafeteria at the high school, we are currently experiencing difficulty with the first floor classroom heat. We have had intermittent heating issues within the last cold spell that has been experienced. Until now the heat levels in the high school were acceptable. The building is operated by two separate heating systems, and the one supplying heat to the first floor classrooms is not working properly. A licensed technician from Trane u.s. Inc, our heating and cooling company, will be here first thing in the morning to repair the system, if not yet this evening. Adjustments have been made to move all first floor classes to spaces in our building that are being properly heated. Despite the change in location, there should be no disruption in the learning or the learning environment. We will continue to monitor the situation, and the progress that Trane is making on the repair throughout the morning. If you have questions, please call the high school office at 641-664-2200. At tonight's game the Rah Rah Rookies will provide us with half-time entertainment during the girl's varsity game. Rah Rah's please be at the gym by 6:00 pm, remember to wear your pink t-shirt. Tonight's scheduled Boys/Girls BB games against Albia are still on! 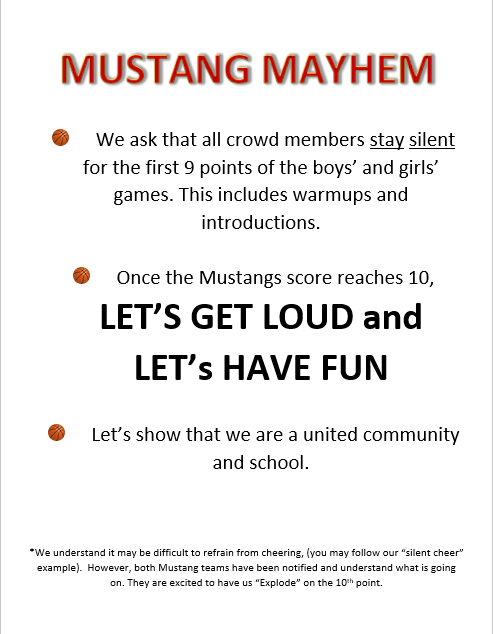 Come out and support your local mustang with action beginning at 5:00pm. Due to extreme temperatures, Davis County Schools have cancelled classes for Thursday, January 31. Davis County Schools will have no after school and evening activities on Tuesday, January 29. Wednesday, January 30, classes are cancelled and building facilities are closed. Thursday, January 31, classes will be running on a two-hour delay schedule. Due to poor road conditions, Davis County Schools will be running buses on hard surface routes only all week; Tuesday, January 29 through Friday, February 1. Here is the link to our Hard Surface Routes Map - https://5il.co/5p9y. Davis County Schools will be running buses on hard surfaces only Thursday, January 24 and Friday, January 25. Here is the link to our Hard Surface Routes Map - https://5il.co/5p9y. The campus visits to ISU and Simpson College have been canceled for Thursday, January 24. We WILL reschedule this trip for a later date. Due to weather, Davis County Schools have cancelled classes for today, Wednesday, January 23, 2019. Davis County Schools will have a two-hour delay on Wednesday, January 23, 2019. Buses will still run on hard surfaces only. Davis County Schools will be running buses on hard surfaces only on Wednesday, January 23, 2019. Here is the link to our Hard Surface Routes Map - https://5il.co/5p9y. The Girls/Boys Basketball games vs. Albia have been cancelled for Tuesday, January 22nd. Are you interested in becoming a substitute teacher? Great Prairie AEA is offering a certification course in Albia. The course will meet 3 consecutive Saturdays, beginning February 16. Iowa law allows an individual who holds a baccalaureate degree from a regionally accredited institution to substitute in grades K-12 for no more than five consecutive days in one job assignment. An individual who holds a Para educator certificate and completes this course is authorized to substitute only in the special education classroom in which the individual Para educator is employed. Use this link #160422 GP - Substitute Authorization Grades Pk-12 https://tinyurl.com/yatweoum to find more information or to register. Davis County Schools will be running buses on hard surfaces only on Tuesday, January 22, 2019. Here is the link to our Hard Surface Routes Map - https://5il.co/5p9y. Davis County Schools will be running buses on hard surfaces only on Monday, January 21, 2019. Here is the link to our Hard Surface Routes Map - https://5il.co/5p9y. All activities have been cancelled and district facilities will be closed Friday, January 18 and Saturday, January 19. **Update** Saturday, January 19th--The Winter Indoor Color Guard Competition has been cancelled. **Update** Saturday, January 19th--Bowling vs. Fairfield has just been cancelled. That meet has been rescheduled for Friday, February 1st at 1:30. Due to the impending weather conditions and for the safety of our students, Davis County Schools will be dismissing classes at 1:00 today, Friday, January 18, 2019. Due to dangerous road conditions, Davis County Schools have cancelled classes for today, Tuesday, January 15, 2019. Davis County Schools will be running buses on hard surfaces only again on Tuesday, January 15, 2019. Here is the link to our Hard Surface Routes Map - https://5il.co/5p9y. Davis County Schools will be running buses on hard surfaces only for tomorrow, Monday, January 14, 2019. Here is the link to our Hard Surface Routes Map - https://5il.co/5p9y. Davis County High School has been in the festive spirit today while wearing their ugly sweaters. Wishing everyone the Merriest Christmas! Attention Senior Parents! You can now purchase a recognition ad in the 2019 yearbook.This is a great way to share a special message and your favorite photos of your senior. Ad design and payment are done completely online through jostensadservice.com. There is limited space and the deadline is February 1st. Contact yearbook adviser Brooke Mason at brooke.mason@dcmustangs.com if you have any questions. DCHS Student Council Toy Drive! Bring in new or gently used toys to the big red stockings in the lunch room. The toys will be given to DCES Kindergartners. This is also a class competition, for a sweet treat before break! Due to weather conditions, Davis County Schools will have a two-hour delay today, Friday, November 30. Davis County buses will return to regular routes and regular times tomorrow, Thursday November 29. Davis County professional development scheduled for tomorrow, November 26, will be postponed and rescheduled for a future date to be determined. 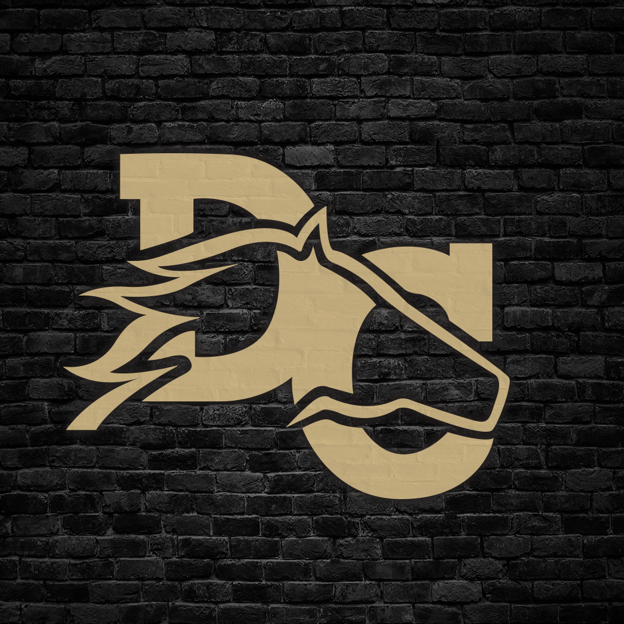 Join us for Winter Meet the Mustangs this Friday, November 16th, sponsored by the DC Athletic Club! Starting at 5:30 we will be having a $5 meal sponsored by the Cattleman's Association! Introduction of Winter sports teams will begin at 6:30 and include: 7th - 12th Boys & Girls Basketball, 7th - 12th Wrestling, Bowling, Color Guard, Band and Cheerleaders! 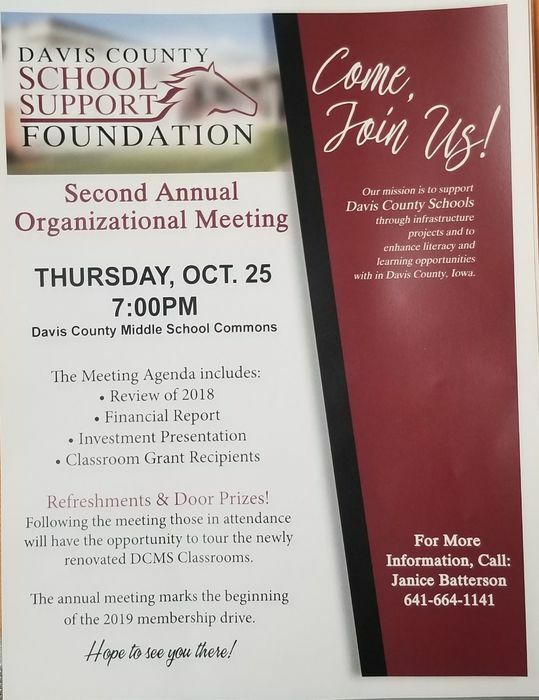 Davis County School Support Foundation Second Annual Meeting will be held on Thursday, October 25 at 7:00 PM in the Davis County Middle School Commons. Come, Join Us! Davis County CSD is seeking substitute teachers, bus monitors, and associates. If interested, please pick up an application packet at the Central Office. The 7th/8th Football game against Eddyville-Blakesburg-Fremont has been cancelled for tonight. Because of predicted weather for tomorrow, the SCC Cross Country meet has been rescheduled to Thursday, Oct. 11 at Clarke of Osceola. The MS and HS Band will not be participating in the Kahoka Parade today. New load time is now 2:45. More than likely, it will be an indoor show tonight. Because of weather, tonight's Football game at Albia has been moved up to 6:00 pm. FB boys will pull out at 3:30. Also, look for our new app!